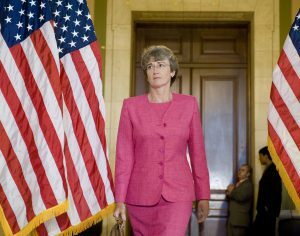 WASHINGTON — President Donald Trump said Monday he has selected former Republican congresswoman Heather Wilson of New Mexico to be secretary of the Air Force. Wilson, an Air Force Academy graduate, served as an Air Force officer in Europe during the 1980s and was on the National Security Council staff under President George H.W. Bush during the fall of the Berlin Wall. Now president of the South Dakota School of Mines & Technology, Wilson would be the first Air Force Academy graduate to serve as Air Force secretary if confirmed by the Senate. Wilson, 56, graduated from the Air Force Academy in 1982 and later earned masters and doctoral degrees as a Rhodes Scholar at Oxford University in England. She served five terms in Congress, where she was a senior member of the House Energy and Commerce Committee and chaired the House Subcommittee on Technical and Tactical Intelligence. She also served on the House Armed Services Committee. Wilson collected nearly half a million dollars in questionable payments from federally funded nuclear labs after she left Congress in 2009, the Energy Department’s inspector general said in a 2013 report. Wilson failed to provide documentation for the consulting work she did to earn $20,000 a month from the Los Alamos and Sandia national labs in New Mexico from January 2009 to March 2011, the report said. Contractors including Lockheed Martin and Bechtel reimbursed the government for most of the $464,203 paid to Wilson, the report said. New Mexico Gov. Susana Martinez called Wilson’s selection good news for New Mexico and the country.